Not to mention having super energy. As a gardener, and an avid vegetable grower, the Fall is especially busy. Not only are there the herbs and veg to harvest, but one actually has to do something with all those piles of luscious leaves and fruits! 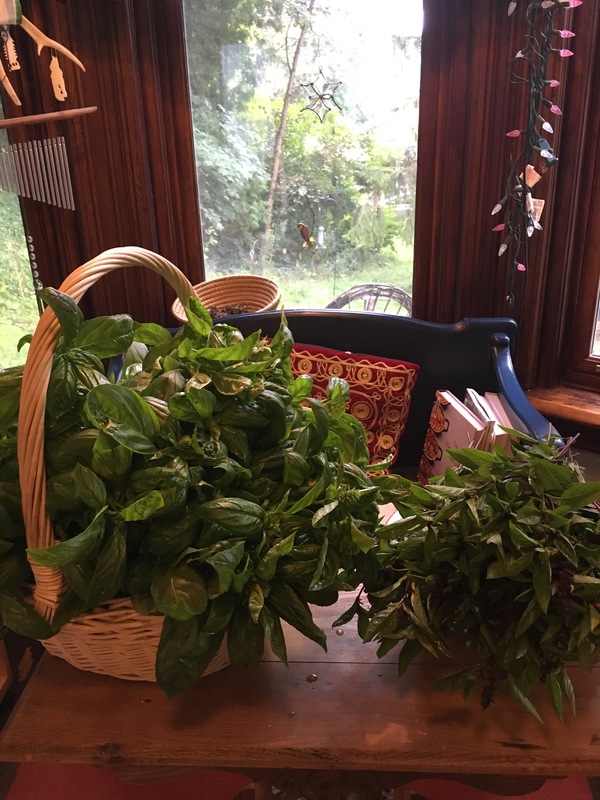 Today I harvested my basil – early but necessary as frost may be very early here in Ontario this year. It looks lovely piled up on the small kitchen table, and has filled the house with a delicious scent. But I also yearn to be in the Studio, and what is an artist/gardener to do?!! Thank goodness for digital photography, I will record the bounty, and later when it has been chopped and pesto-ed and put away, I will re-live this moment and record it in my sketchbook. Genovese Basil and Thai Basil.